Special thanks to Shaoyan Hu (Husy) for his contribution to this article. It has been days since the Chinese Nebula Award Ceremony for this year. Memories have started to fade away. I have to put everything together in this report before I forget too much. 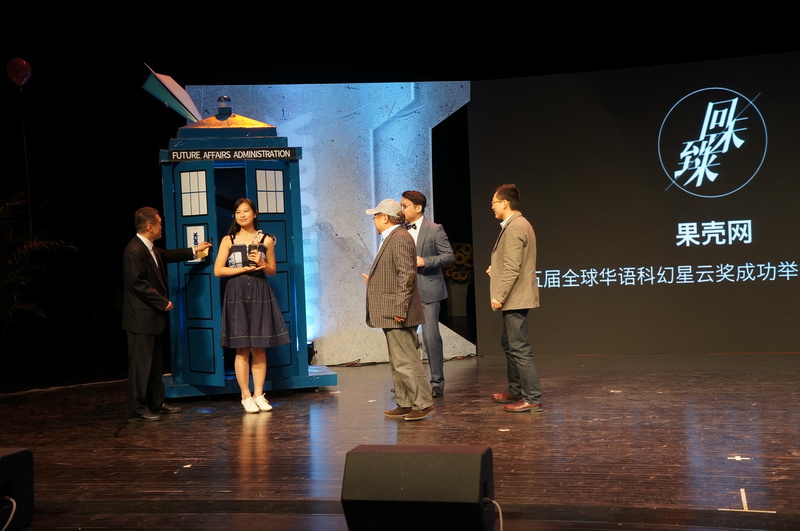 The Chinese Nebula Award Ceremony has always been more than just a ceremony. It is a carnival made up of various elements: marketing campaigns, seminars, signing sessions, red carpet walking, galas and concerts, etc. After 2012 in Chengdu and 2013 in Taiyuan, this is my third time attending the Nebula, and this year it was in Beijing. This year, the whole event was organized by Guokr.com, the same group of people behind the Beijing 2016 Worldcon bid. With their experience acquired from attending Loncon3, they managed to make the event largely resembling a SF convention held everywhere else in the world. It was given an English title, 2014 SFCon, which I found quite informal and confusing. So I will continue to call it the Chinese Nebula here in this report. Before plunging into the details of the event, I had better explain a little about the Chinese Nebula Awards first. As you may see from my previous post, the Galaxy Award had been the only SF award in China for a long time and only the works published in or by Science Fiction World magazine are eligible for nomination. 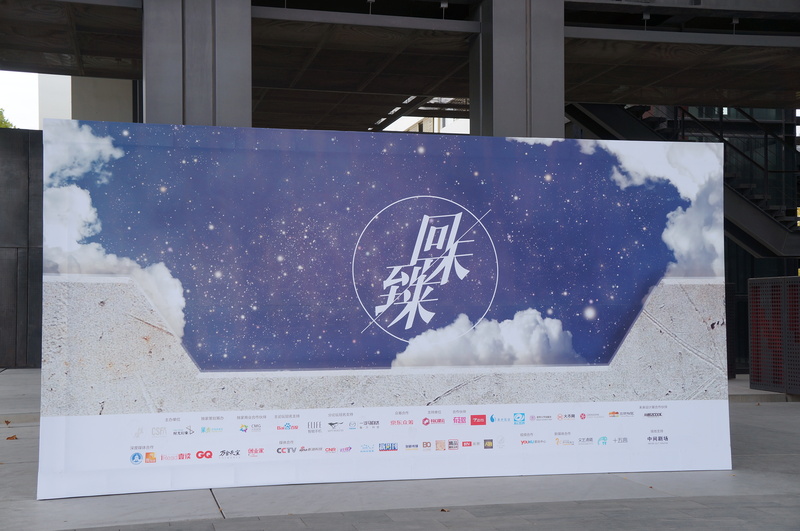 However, the Chinese Nebula Award recognizes a wider range of works published by any organizations located in mainland China, Hong Kong and Taiwan. As it is, the World Chinese Science Fiction Association (WCSFA) organizes the Chinese Nebula Award Ceremony every year. All members of WCSFA can nominate for the Chinese Nebulas. Both members and non-members can vote for the shortlist. But it is the judging panel that has the authority to decide the final shortlist. Usually there are five shortlisted names for each award category and all of them will at least get a silver award. In order to be fair, only the chair of the judging panel is announced at the very beginning of each year, while the rest of the members are kept secret until the award ceremony is to be carried out and all the results are settled. The members of the judging panel change every year. Members of the judging panel cannot be nominated for any awards in the same year. This year, the chair of judging panel is a famous science fiction writer, Han Song(韩松), who is known for his unique style and blunt writings that address issues in modern-day Chinese society. Before the weekend event, I attended a seminar dedicated to the works of Wang Jinkang(王晋康) who is one of the most prominent figures in the field of contemporary Chinese science fiction. 2014 marks the 20th anniversary of his writing career. During those 20 years, Wang has published 87 short stories and 13 novels, and has won 18 Galaxy Awards and 3 Chinese Nebula Awards. The seminar was held in the afternoon of Oct 31 in Renmin University of China in Beijing. Scholars and practioners of science fiction, mainstream literature and popular science had gathered together to contribute their opinions on Wang’s works. 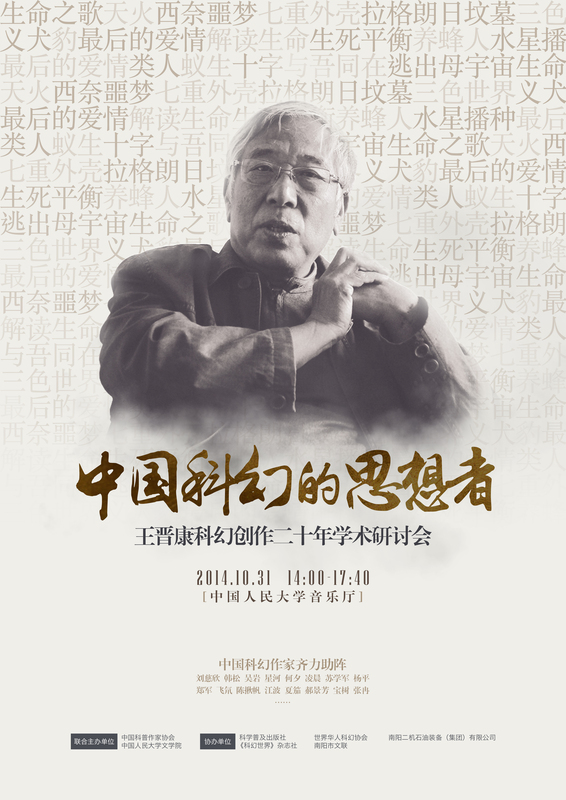 Poster for the seminar on Wang Jinkang’s writing. Zhang Yiwu(张颐武), professor at Peking University admitted that “science fiction writers tell the story honestly while mainstream writers are playing tricks with their skills in literary modernism ”. In all probability, this might be the first time that a science fiction writer had attracted so much attention from other areas. And Wang Jinking deserved it. 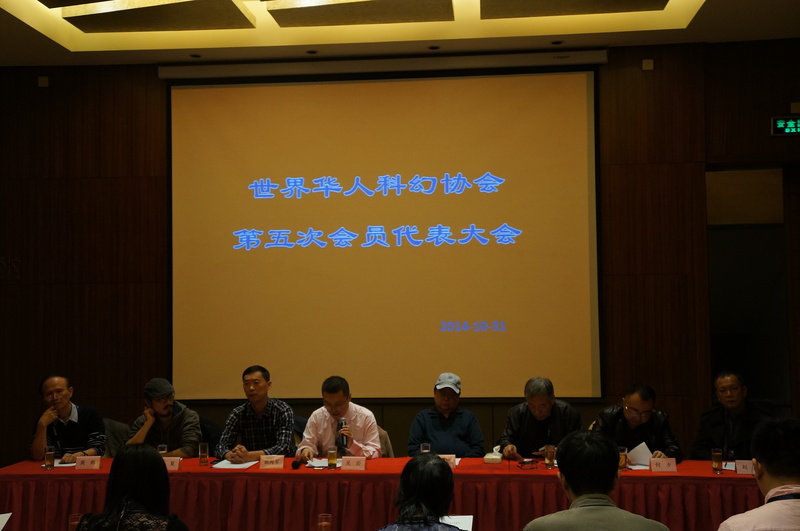 In the evening of Oct 31, the annual meeting of World Chinese Science Fiction Association was held in a hotel conference room. Yao Haijun(姚海军), editor-in-chief of Science Fiction World magazine chaired the meeting. Wu Yan(吴岩), chair of WCSFA presented a report on the activities of the organization in the past year. All the attending members managed to make a short speech to introduce themselves and share their visions of the Association. WCSFA is the largest organization in the world for Chinese science fiction. Its members consist of writers, translators, editors, publishers, movie-producers, directors, researchers, event-organizers, fans, etc. Practically, anyone who contributes to the Chinese science fiction society could become a member. The website for WCSFA (www.wcsfa.com) serves not only as a window of the Association and the Chinese Nebula Award, but also as a platform for science fiction news and events all over the world. As I mentioned before, instead of western style parties, late night barbeques and drinking are the way Chinese SF people enjoy the gathering. In November it was too cold to eat and drink outdoors in Beijing. Instead, we gathered in a small restaurant. On the night before the event, many people retired early for a good rest, so it was not a large group (but included several bright new stars of Chinese SF). The restaurant closed early, and we had to leave after one round of games. It was a foggy night, hard to find stars in the sky. In order to set up our fan table at the Nebula Market Place, I got up early on Saturday, Nov 1. Most dealers arrived the day before and managed to set up their booths before the market was opened to the public. We had registered for a fan table for the Helsinki 2017 Worldcon bid and SF AppleCore (科幻苹果核), our fandom in Shanghai, but somehow found no table available at the designated location. Luckily, the problem was solved later on and we managed to present ourselves properly in the end. 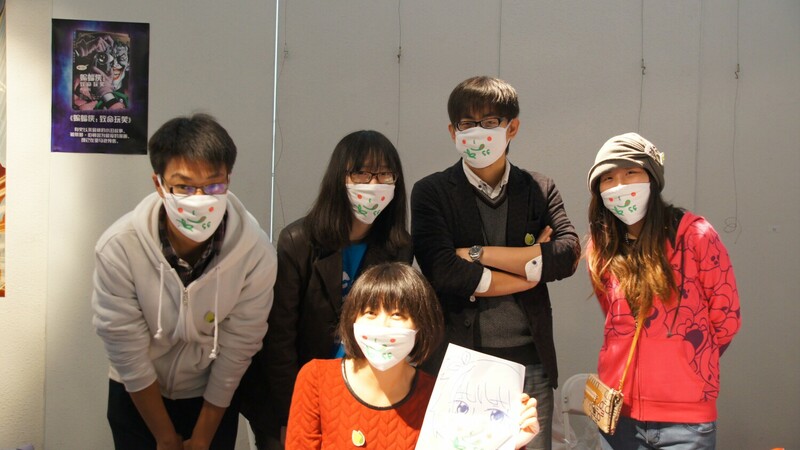 Considering the haze in Beijing, AppleCore had brought in some customized cotton masks with AppleCore logos, but they were not selling well. To catch a lager flow of visitors, the exhibitions for AppleCore were moved to the other end of the market place, sharing the same space with www.wcsfa.com (科幻星云网). As a result, Helsinki 2017 was left alone in its original location. 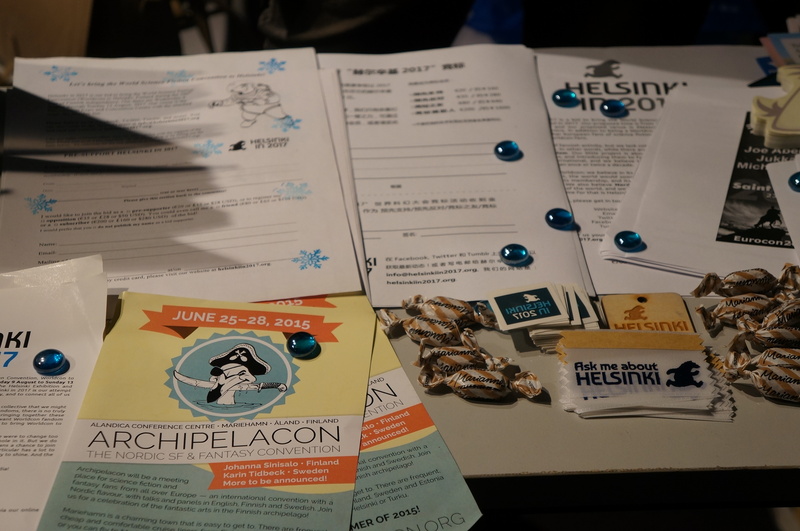 Helsinki is bidding for Worldcon in 2017. Having taken the effort of carrying the entire promotion package from Finland as the agent in China (actually from Dublin to London to Helsinki to Moscow to Shanghai), I definitely would not want to miss the opportunity to showcase the Helsinki bid. No one bought supporting memberships as I had expected, but quite a few showed interest in the bid. I also took some promotional materials for other foreign cons with me. It is a long way before the majority of Chinese fans could get used to attending international cons, but we are moving forward nevertheless. To know more about the Helsinki 2017 bid, please follow “Helsinki in 2017” on facebook or twitter. In order to vote for them, you need to have a supporting or attending membership for Sasquan first. The opening forum of the event took place in the afternoon of Nov 1. It had a rather cool name – “7 Billion Futures of Human Beings”. The host encouraged the audience to fold paper planes and throw them onto the stage. Although I did not know the meaning of this set up, the audience seemed to enjoy it. Ken Liu talking about The Robot Revolution. 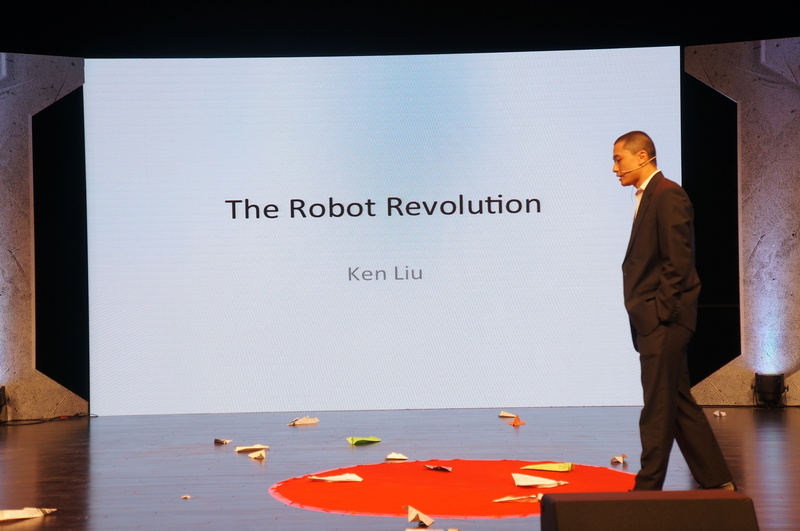 Ken Liu (刘宇昆), award winning Chinese American sf writer and translator, gave a speech of The Robot Revolution. Zhang Zheng (张铮), scientist, professor at New York University Shanghai, presented his ideas about images of humans from the viewpoint of machines– The Machine Revolution, Take 2. Li Miao (李淼), scientist, dean of the Institute of Astronomy and Space Science at Sun Yat-Sun University, talked about Human Beings in the Universe. Han Song, science fiction writer, journalist at Xinhua News Agency gave a presentation titled the Universe in Human Beings. After these brilliant and well-prepared speeches, there was a panel discussion about futurism. The panel consisted of science fiction writers Liu Cixin, He Xi (何夕) and Wang Jinkang, as well as a researcher from Taiwan – Lin Jianqun (林建群), and a writer/researcher from Japan – Toya Tachihara (立原透耶). Panel discussion about future. 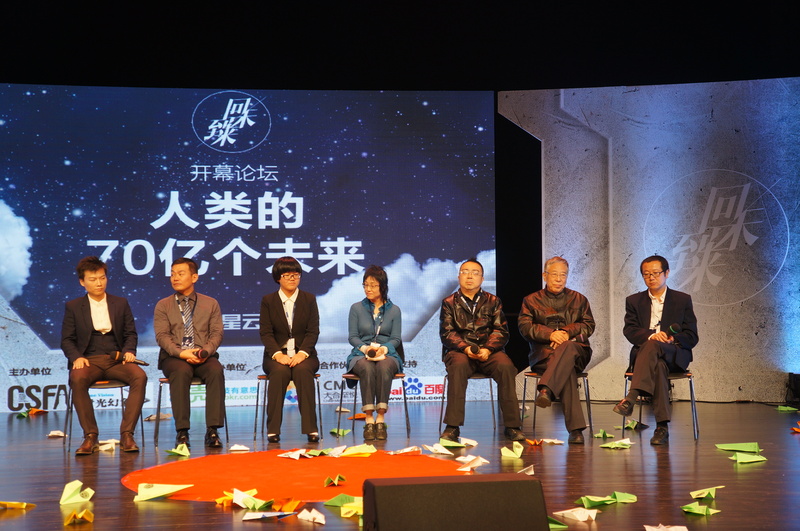 From left: Chen Qiufan, Lin Jianqun, Interpreter, Toya Tachihara, He Xi, Wang Jinkang and Liu Cixin. This year, the Chinese Nebula had adopted the ideas of other international cons. There were parallel sessions going on at the same time. So I missed the seminar on Chinese science fiction movies because of the opening forum. I did not go to other panels on that day. Instead, I stayed in the market place, where a buffet was set up in the evening. It was really cold, both the weather and the food. As you may know, Chinese people prefer hot meals for lunch and dinner if not breakfast. The buffet is more like the con parties: beers and snacks, chatting and mingling. Unfortunately, due to the limitation of space and budget, not everyone can attend the buffet. However, you could still see all the important figures in the Chinese sf community: writers, editors, organizers, translators as well as a few cosplayers and fans. In order to make up for the lack of a proper seated hot meal, part of the original group and part of those who could not attend the buffet gathered in a restaurant nearby afterwards. And they drank. There was said to be an “Er-guo-tou (a strong Chinese white alcohol – baijiu) only policy”. I had to admit that all the Chinese SF writers are such good drinkers. No one knew how many bottles those people consumed, but they became more interesting when the bottles were emptied. You could tell that they were a little bit drunk, but not enough to lose control of themselves, although some of them did vomit after getting back to hotel. It was a lovely night, with stars shining in the sky. You could easily draw the conclusion that those who claimed seeing no stars had drunk a little more than they should have. Amazingly, the drinking gang managed to get up the next morning for their panels or seminars. On Nov 2, I did not go to any other programmes but the one I was on. 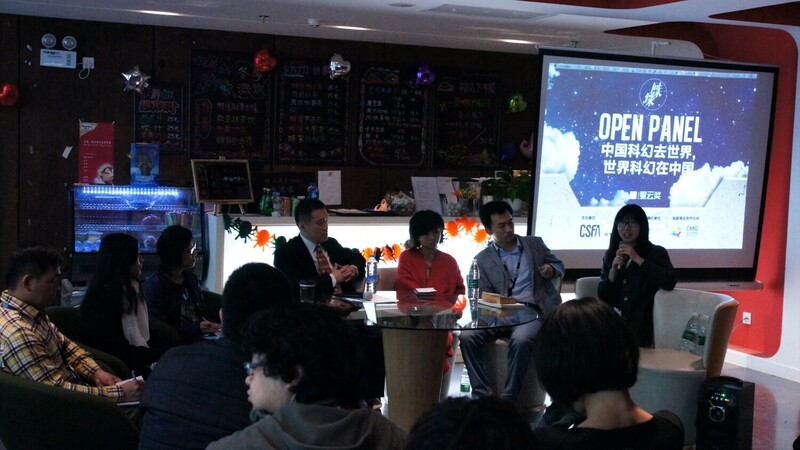 “World SF in China and Chinese SF to the World” was an open panel hosted by Professor Wu Yan, a scholar studying science fiction literature at Beijing Normal University. Apart from myself, there were five more panel members: Li Zhaoxin (李兆欣), SF reviewer; Tang Fei (糖匪), SF and fantasy writer; Toyo Tachihara, Japanese SF and fantasy writer/scholar; Gao Hanning (高寒凝), PhD candidate majored in SF at Peking University; Lin Jianqun (林建群), SF scholar from Taiwan. Through the discussion, we realized that about 60% – 80 % of the SF stories that had won Hugo and Nebula awards had already been translated into Chinese. However, we were not doing so well in works written in languages other than English and Japanese. As for the other way around, we are quite ambitious and active in promoting Chinese SF in the English world. The Three-Body Problem(《三体》) is the first contemporary Chinese SF novel translated into English. ClarkesWorld will start the Chinese science fiction translation project next year. Science Fiction Studies published a special issue on Chinese science fiction in 2013. Toya said that as a Japanese, she envied us because we have Ken Liu, the star translator who has rendered many Chinese SF works into English with reliable precision. Yes, it is our honor to have Ken! The climax of the weekend arrived at around 16:30, when the red carpet was ready and all the guests were dressed up. A Red Carpet show is a tradition at the Chinese Nebula. This year, SF fans were also invited to walk along the red carpet together with other guests. AppleCore was the second group, so I could only see the rest of the procession in the photos later. 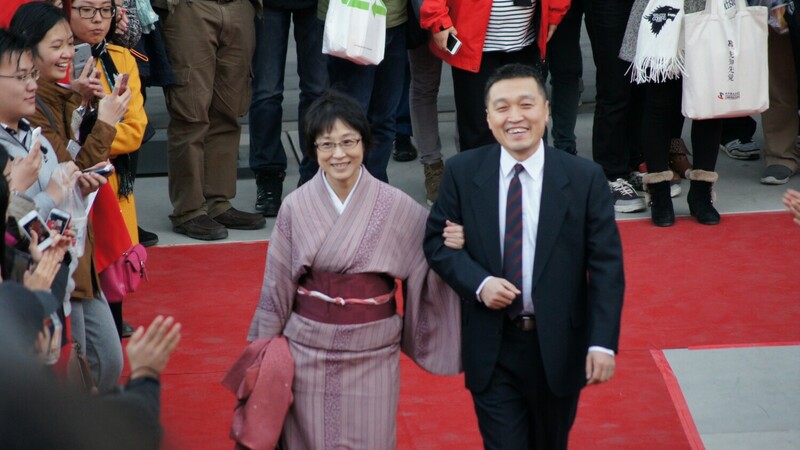 Despite the chilly wind in winter, many guests still dressed quite cool. You know that SF people are brave. 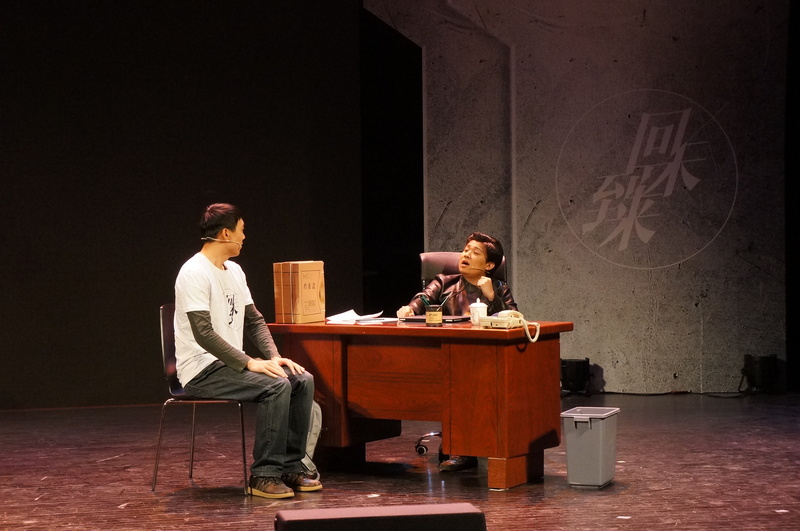 The closing ceremony started with a drama, written by Liu Cixin (author of Three Body Trilogy) and directed by Ji Shaoting (journalist at Xinhua News Agency, head of Future Affairs Administration, which is another fandom). With professional actors and actress, the performance was a nice experience to savour. The story was about a SF fan who was criticized by his boss as immature and unrealistic, while the boss himself had once been a SF fan and now grew up to do ‘proper’ things suitable for his age. However, when the alien invasion came, the young SF fan was the one who behaved calmly and worked out a solution. To some extent, this story reflected the state of SF in mainstream Chinese society. Most of the science fiction fans in China are young students. When they grew up and started to work, they gradually lose their interest in SF and focus more on “proper” stuffs expected of their age. If you claim to be a SF fan in front of your boss, you may be judged in a different light. But things are getting better now and hopefully, we will see more “senior” fans in the coming decades! Drama written by Liu Cixin. The award ceremony began after the drama. 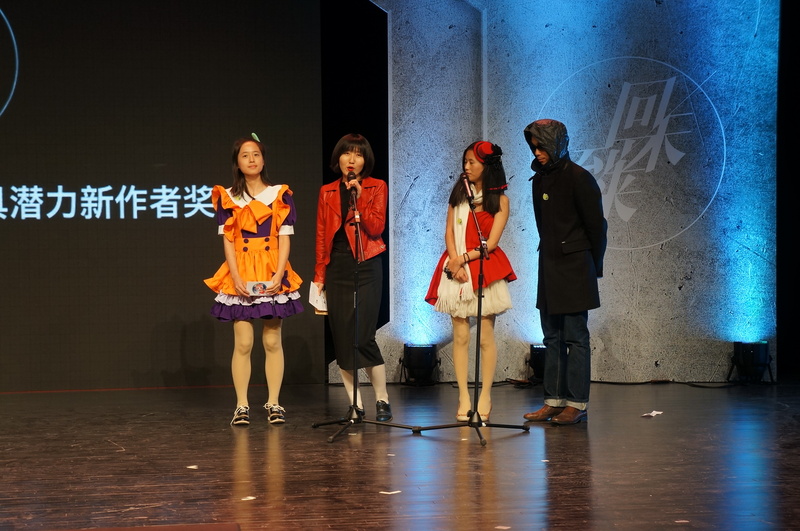 The first 4 awards were presented by the organizing committee instead of the judging panel of Chinese Nebula. Three Special Contribution Awards were given to Guokr.com for their efforts in organizing the event; to the 6-volume Anthology of Chinese Galaxy Award, which is a compilation of the award winning stories in the past 30 years; to Ken Liu for his fascinating intercultural writing as well as his fruitful achievements in translating and promoting Chinese SF works in the English world. 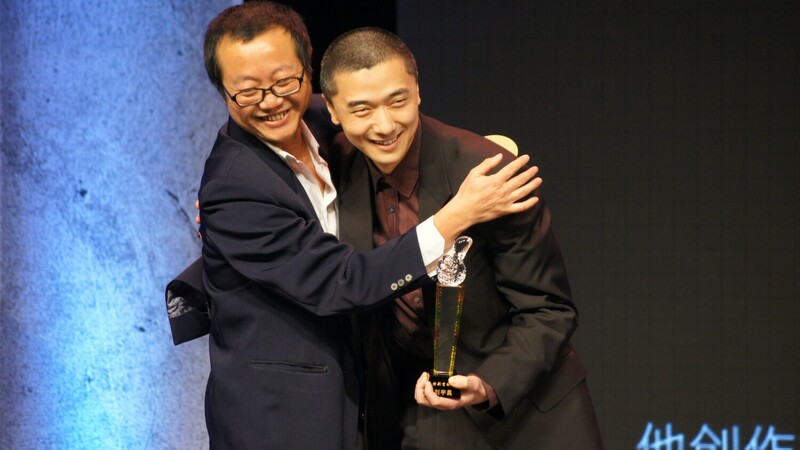 Lifetime Achievement Award was given to Wang Jinkang for his excellent and diligent writing in the past 20 years. In a flare of impressive showmanship, ETO (Earth Three-body Organization, a fandom shadowing the organization in Liu Cixin’s Three Body Trilogy) anounced all the members of the judging panel of Chinese Nebula Award for this year..
AppleCore was designated to present the Most Promising New Writer Award. Unfortunately, part of the team, including myself, had to leave the theatre to catch a flight exactly when the other members were on the stage. For the same reason, I missed the opportunity to receive my trophy of Silver Award for the Best Fan. Although not without pities, there were lots of fun and joy in those two days. Next year the Chinese Nebula Ceremony will be in Chengdu. I have already started looking forward to it. Trophies were taken out of TARDIS. 2 thoughts on "Report on Chinese Nebula 2014"